So, finally back from the hospital =D Everything worked out perfectly (my surgery was on Monday) and I feel quite well today. I am already at home (there were 2 packages from Japan waiting containing wonderful body soaps and shampoos!) and wearing makeup today lol! 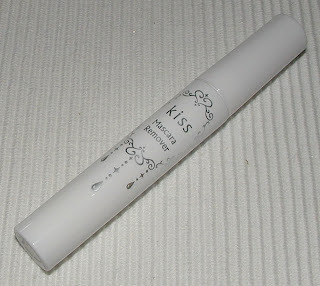 I purchased 2 of Kiss' new spring items recently from Ichibankao so it's about time to review them. 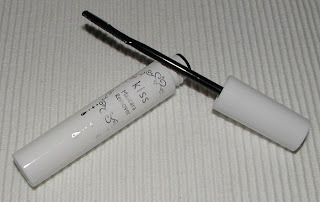 Kiss revamped their lipstick line releasing 2 new ranges (Rouge Kiss and Rouge Kiss G). I've always loved Kiss' lipsticks so I definitely was interested in trying out one of the new lippies. 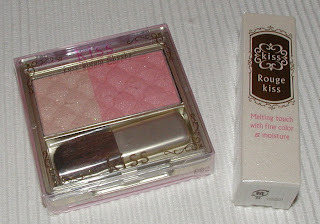 I also got the new Pure Bloom Cheeks shade 05 Cherry Blossom as it looked like a cute light pink that was sure to flatter my complexion. 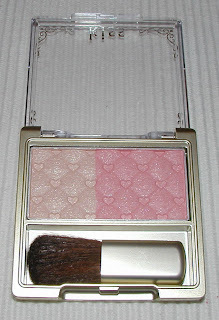 I really love my 01 Bougainvillea blush I reviewed here and 05 is absolutely adorable, too! 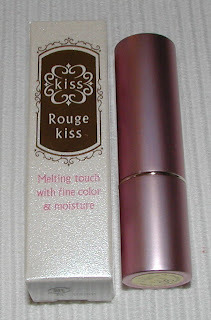 The pink metal tube is very similar to their older range of lipsticks. Pretty and princessy but in a simple and subtle way. 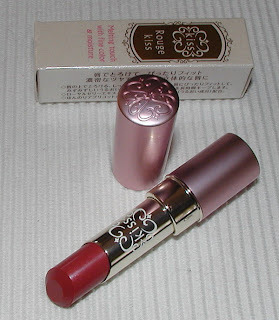 The lipstick is quite pigmented with a nice creamy and quite moisturizing formula and a super light fruity scent. The color 06 Berry Kiss is a pretty medium berry red with subtle brown tones. I'd say this color is quite neutral, neither too warm not cool. The blusher comes in a simple plastic compact. 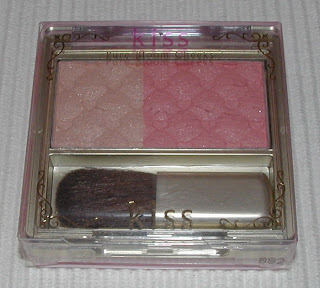 I think Kiss could have invented something prettier for their blushers like their eyeshadow quad cases but with the embossed hearts the blush looks cute nonetheless. The brush is surprisingly soft but a bit too small to be of real use. It will do the trick when you're on the go though. 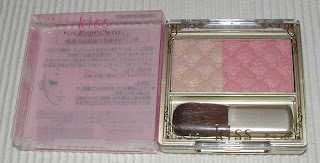 The blush is finely milled and carries decent pigment. You get a light shade you can use as a highlighter and a blusher. You can also swirl the colors together to make the blush a little lighter. 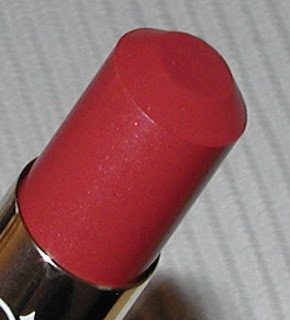 The colors of #05 Cherry Blossom are a beautiful light pink and a pale fleshy pink shade. The finish is a soft satin glow. Very lovely! I really can recommend both items. Adambeauty doesn't carry the items yet but Ichibankao has them listed on the site. 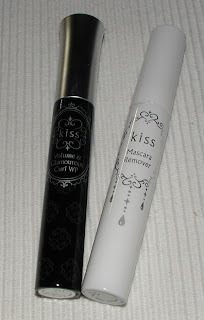 I also purchased the mascara value pack from Kiss! 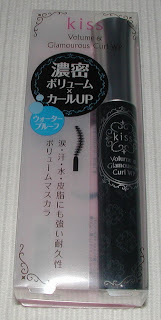 It comes with the Volume & Glamorous Curl WP mascara and their Mascara Remover and retails for only 1680 Yen. 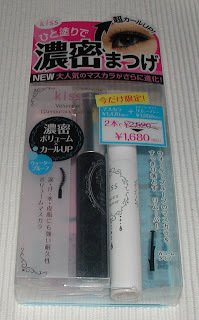 This means you only pay like 200 Yen for the Mascara Remover (about US$2!). However sure online you'll pay quite a bit more but it still works out to be a nice deal all in all. 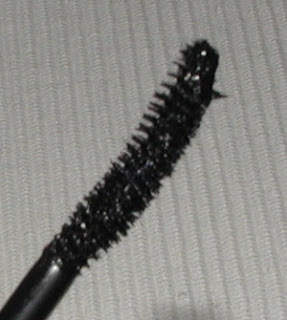 Let me tell you that the mascara is really great! 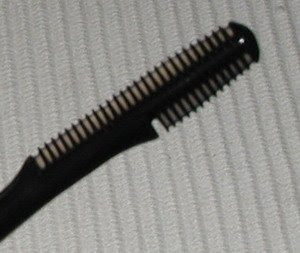 It gives very good volume and holds the curl. I don't experience smudging, flaking or fading all day long. The Mascara Remover doesn't convince me really. 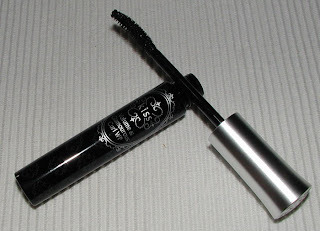 It can do its work in an emergency case but for removing my mascara with it daily this is much too time-consuming as I have to apply like 5 coats of the remover and wipe in between to get most of the mascara off. welcome back! :) i'm glad you're feeling well! Glad everything worked out and you're feeling better! That blush is too cute for words!!! Ooh, do you like that mascara better than the MM ones?